Homeowners get pub like scene in rooms, basements. Who couldn’t use a martini after a hard day at the office? Bob and Patty Davis sure could. The Great Falls couple installed a cherry-wood bar in their basement two years ago, and now the room serves as their home’s social hub. “It’s an open area … people go down there and park,” Mr. Davis, 47, says of his bar, which even has drawn raves from English pals for having a genuine British pub feel. He and his wife feel the same way. “We found that we’re down there all the time,” he says. Home bar owners aren’t necessarily drunk with glee over the chance to mix their favorite beverages in the comfort of their own living rooms. Many simply like the look of the sleek oak or pine cabinets bedecked with shapely glassware. Others pour nothing more intoxicating than soda into their drink glasses. 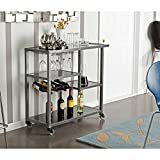 Whatever the motivation, creating a home bar can transform an ordinary room into a haven for everything from small talk to conversations lasting deep into the night. When the Davis’s’ decided they wanted a home bar, they found Bars by Bud in Falls Church after an exhaustive online search. Bud Mepham has been creating bars by hand for 26 years. He custom-made the Davis’s’ bar to their space specifications, a service he performs for all his clients. Mr. Mepham’s shop teems with bar goodies, from patio umbrellas to neon lights touting the usual brew suspects. The showroom sits adjacent to an 11,000-square-foot studio where he spends up to three months crafting a bar. Prices for his ornate handiwork start at around $700 for a simple model and can rise considerably as the size and scope of the piece expands. 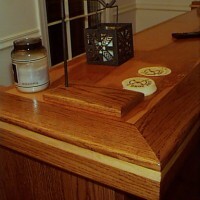 Most bars are made of high-quality oak or maple, though cherry wood is another popular option. Others don’t have alcohol in mind when they line up a row of highball glasses. “Some of the people are strictly teetotalers, but they still entertain at the bar,” he says. The sting of peer pressure coaxed Tom Newell, 41, of Ashburn, Va., into Mr. Mepham’s shop to consider buying a bar. “The neighborhood we live in, most of the folks have one,” Mr. Newell says. Mr. Davis envisioned his bar, dubbed Ye Olde Crop and Carrot in a winking nod to his wife’s love for horses, as a haven for wine and martinis, not six-packs. “It has a very warm, Old World feel,” he says of the bar. Their basement’s support beams are covered by fluted cherry-wood columns that flank the bar. Mr. Mepham even built a wine closet, complete with a stained-glass door, around the room’s curving set of stairs. Conrad Snow, president of Vision Quest Mill Works in Alexandria, says customers routinely ask him to build bars for their homes, and that has been especially true over the past year or so. “People hunker down in times of turmoil,” he says. He typically meets with a homeowner, sketch pad in hand, to flesh out ideas for the perfect bar. 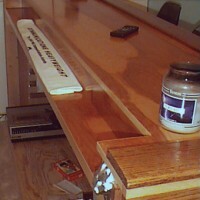 Customers request a variety of woods for their bars, from maple to a basic red oak, which is the wood of choice for most. A custom-made bar can range in price from $5,000 to $20,000, he says. 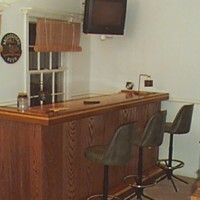 Home bars can either be wet or dry – “wet” meaning they are built around or near a sink apparatus. Mr. Snow cautions that not every room is suited for a wet bar. For basements without drainage systems, an ejector system is needed. These systems, which range in price from $800 to $1,000, pump water to existing pipes above it. Most modern homes include pipes in the basement, typically to allow for another bathroom, he says. 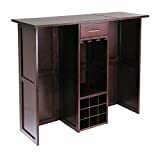 Learn more about building a wet bar. 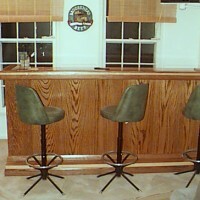 Homeowners also can build their own bars, should they have the necessary woodworking skills. 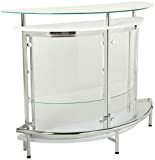 They can tap ready-made bar plans at Internet sites such as www.barplan.com. 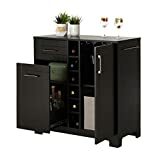 Steve Houdek, a Green Bay, Wis., woodworker who runs the Easy Home Bar Plans web site, (the site you are current viewing) says his bars can be built for a minimum of $140, not including the price for the plans. Silver Spring resident Bill Engelhardt, 34, decided to install a dry bar in his home last May to bring some life into his living room. He found Mr. Houdek’s site online and did the rest himself, along with his radial-arm saw. 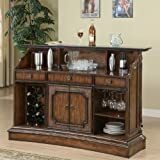 His oak bar supplies the festivities for special occasions or to treat visiting buddies from his native New Jersey for the big game. He even installed a television set above the bar, just like many sports pubs. The next 5 images are from Bill E. Silver Spring, Maryland a great demonstration of how the bar plan is easily customized using high quality stock, not to mention Bill’s A+ workmanship. See: Washington Times Article. Bill E. Silver Spring, Maryland Nice custom work! 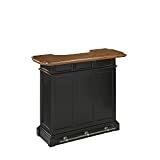 A less expensive option for those dreaming of a home bar is to pick up a pre-made bar at stores such as Champion Billiards and Barstools, a local chain with shops in Virginia and Maryland. Chris Kelly, the chain’s director of operations, says his bars start at around $350 and can ramp up to about $12,000 for deluxe models. The most popular models stretch out to about 6 feet in length. 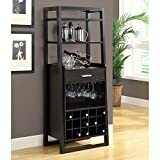 The more popular models feature faux marble tops with plenty of space in the back for wine bottles and other glassware. 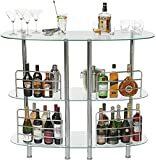 Here are some very cheap models to get you into your own home bar. When Rich Kolodziej, 56, renovated his home in Vienna several years ago, he left open space where a bar could be built. Finally, he decided to act. He hired a contractor to create a sleek art-deco bar 180 degrees opposite of the warm earth tones others might favor. Today, the gleaming black bar is a beauty. And it often sits unused. One thing Mr. Kolodziej has learned about the bar-making process is not to ignore the less flashy interior. “It’s easy to make the front of it look great and not think about what’s behind it,” he says. Homeowners should ask themselves how easily they can slip in and out from behind the bar and also should make sure plenty of light is shining at the back of it. “If it’s dark back there, it just becomes a cave; you never go back there,” he says. It might not be the most practical purchase, but the space “comes in handy” when friends or relatives do make a house call. “It’s there, it’s finished, and it looks great,” he says.